What Do You Know About Aleppo and Syria’s Civil War? Many are volunteering and providing humanitarian relief in Aleppo and other war-torn cities in Syria to help refugees…The least students can do is read the news. As college students, we have an obligation to stay informed about world events. We are, after all, the next generation of policy-makers, reporters, journalists, military leaders and intelligence officials. It is highly likely that we will inherit a contention of failed policy in the Middle East. In light of all this, I, the humble opinion editor of Bard Watch, have a few things to say about the United States’ involvement in Syria that is worth our consideration, at a minimum. With the fall of Aleppo , Syria’s fate is now more uncertain than ever. It is clear that Assad’s regime – supported by Russia, Iran, and Hezbollah- is not likely to go anywhere. However, much of Syria is still controlled by thousands of competing rebel groups, including ISIL, and his prospects for retaking the entire country are still rather dim. Meanwhile, here in America, the mainstream ‘debate’ regarding Syria has about as much substance as Keeping Up With the Kardashians. Politicians on both sides of the isle claim Obama has totally fudged his response on Syria. Obama correctly asserts that it is ludicrous to think that America could have decisively changed the outcome early on in the conflict by having sent more arms. Meanwhile, I seem to recall that a few weeks ago I overheard someone on CNN proclaiming that the “Free Syrian Army” still exists. Commentators and politicians–including 2016 presidential nominee Gary Johnson–who seem to know as much about foreign policy as I know about knitting make ludicrous assertions on panels on major networks. Meanwhile, as the people of Syria die by the tens of thousands every month or languish in refugee camps, President Trump attempts to ban them from entering the United States under his new immigration executive order, signed January 25. To put it succinctly, the American conversation on the Syrian Civil War, the refugee crisis and immigration from the Middle East is crap. As students, it’s our job to listen to this conversation, critique the comments of reporters and politicians, actively fact-check certain information, and assess the debate in and outside the classroom setting once we have looked at a wide variety of sources and interpreted information in order to develop our own viewpoints. We cannot continue to be complacent or passive when it comes to the Syria debate in terms of US intervention and airstrikes, the refugee crisis and immigration to the US. 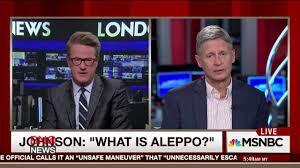 On the 2016 presidential campaign trail, Libertarian nominee Gary Johnson asked, “What is Aleppo?” in an MSNBC interview. He had no idea what Aleppo was, unsure if was a thing, place, or person. 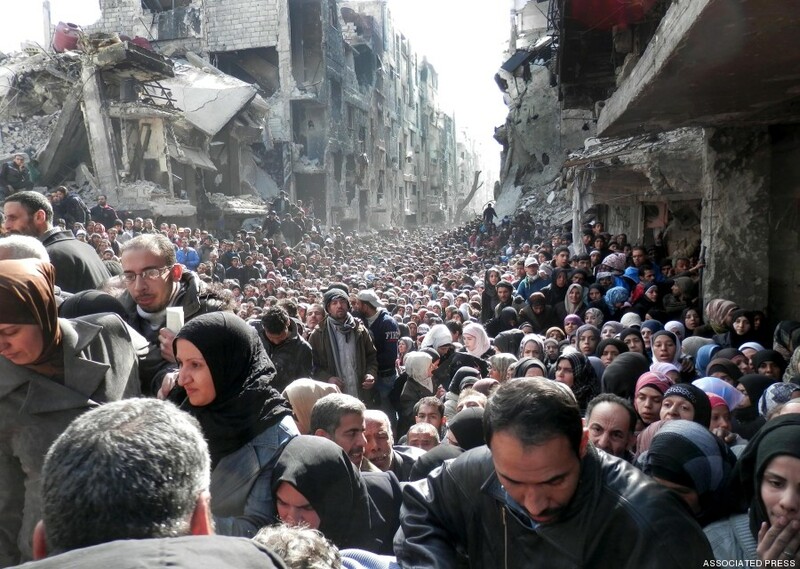 Aleppo is a war torn city in Syria that is often mentioned when talking about the world’s refugee crisis. Photo by MSNBC. About a year ago, The Guardian published an article which featured a claim that many might find astonishing; in 2012, the Russian Government offered to have Assad step down and have his regime enter into negotiations with the rebels. America and our allies rejected this offer because we were convinced Assad’s regime would lose. Assad is a genocidal lunatic, but he’s also a pretty brilliant strategist. He managed to hang in there, and in 2015 Russia began intervening on his behalf with air support. If we had taken taken the Russian offer and the war had ended, hundreds of thousands of lives would have been saved, and ISIS–which came to power two years after America rejected the deal–probably never would have gained a stronghold in Syria. We blew our one concrete chance at creating peace in Syria–to date at least–because we arrogantly assumed Assad wouldn’t make it, with or without the Russian’s deal. But this does not surprise me. Our Syria policy has never been centered around creating peace, although some people in our Government certainly want that. It has been about getting rid of a government that is hostile to the U.S and replacing it with a Sunni client state. 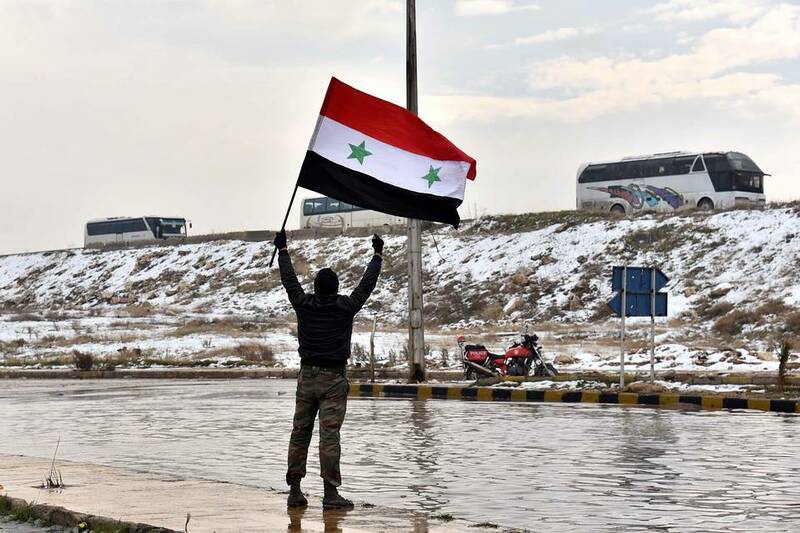 Even with Assad gone, his alawite regime would have remained intact, which would have allowed Russia to continue to project power into the region. But in retrospect, this seems far better than the current situation, in which Assad remains in power and ISIS rampages across the country. Many people understand this by now, but it’s still worth saying. Whatever is left of the Free Syrian Army is not playing a significant role in the conflict. Many of the leaders fled for Turkey, and many of the fighters joined other rebel groups, including ISIS. They are no longer a significant force in the country. The idea that the Free Syrian Army was an organization whose members were all pro-American and pro-democratic was untrue. There were, of course, people in the FSA who adhered to those ideals. There were also fighters who defected to ISIS and Al Nusra, Al Qaeda’s Syrian affiliate. First of all, the phrase “Moderate rebel” makes me laugh. It’s a non-sequitur. If you are angry enough about the political situation in your country to pick up a gun and start shooting at people, you cannot possibly be a moderate. When the U.S government talks about Moderate Rebels, what they really mean are rebels who are supposedly pro-American and perhaps more conscious of human rights, such as the Syrian Democratic Forces. It is a mistake, however, to think that these groups are “moderate” in any way. Their allegiance to us is contingent on any advantage they think we might offer them, and they have been implicated in atrocities. I voted for Hillary Clinton. I admire her and I think she would have made a fine President. But her contention that America could have improved the outcome by better arming the rebels betrays her ignorance of history. She is assuming of course, that once the rebels defeated Assad there would have been peace in Syria. There is no historical precedent suggesting this would have happened though. The Afghan rebels, who America backed with billions of dollars of arms and training, defeated the soviets and the communist puppet government. The fighting certainly did not stop after that. Nor were the Libyan rebels, who we gave air support, able to bring peace to their country. Defeating Assad early on would not have guaranteed peace. The rebels were never able to unify all of Syria’s many ethnic groups, and the Salafist presence in their midst drove many of the country’s minorities into the arms of Assad. New groups would likely have formed after Assad’s fall. The idea that the rebels could have formed a cohesive democracy in which all of Syria’s many groups felt heard and respected is, frankly, laughable. I’ll start with the the safe-zone, as it is the much worse idea of the two. A safe zone, or humanitarian corridor, means creating an area that is safe from the entire war. That means more than defending an area from air strikes; it means creating an area safe from rocket, artillery, and small arms fire. According to John Kerry, we would need 15,000 to 30,000 U.S troops to create a safe zone, along with the troops of our allies. What would stop the Syrian Army, Hezbollah, or Al Nusra/ ISIS from attacking troops we would station in Syria? Iranian troops are also present in Syria; an engagement of force with the Iranians could also have catastrophic consequences. In short, the likelihood that this would lead to all out war for America in Syria is very high. A no-fly zone is a less bad idea, but also highly risky. I have seen the videos of hospitals exploding in Aleppo, and I although I am opposed to meddling in the sovereignty of other countries on principal, I would not have been horrified to learn that a few American cruise missiles had meandered their way into Assad’s air force bases. However, Russia’s involvement in the war has rendered this option untenable. Shooting down Russian planes would likely have massive ramifications. Photo by Abdalrhman Ismail/ Reuters. It is becoming increasingly fashionable to suggest that we should team up with Assad in our fight against ISIS. Although I believe in engaging with Assad, I don’t believe in making him our ally. There is a video on Vice News featuring a journalist embedded with Al Qaeda as they retake a Syrian town from Assad’s army. After some combat, they enter a hospital that the regime had been using as a base. They take the journalist inside the hospital and show him a room that is literally filled with corpses. A tangled mass of cold, white limbs and faces, punctuated by streams of partially dried blood. The rebels say that in anticipation of their advance, the Syrian Army had murdered dozens of suspected rebel collaborators. In an act of heinous irony, the Syrian Army had turned a hospital into a killing factory. This is just one of many such massacres that have been reported throughout Syria. According to the WSJ, the regime has murdered suspected opponents in the tens of thousands. Photo by Zuma Press/ WSJ. We must engage with this murderous regime to end the war. However, engagement does not mean that we make them our ally. It means finding ways to bring them to the table, and creating a reasonable dialogue between the interested parties in this conflict. We must find a way to do that without turning Assad, a man whose depravity is on par with Milosevic or Omar Al Bashir, into our friend. One thing we could do that would help those affected by the conflict would be to admit Syrian refugees into the US by the millions. We should, yet, of course, we won’t. For all our willingness to perpetrate brutal violence against our enemies, we remain terrified of refugees. Paradoxically, we are afraid that people fleeing ISIS will harbor ISIS sympathies. We played a role in creating this conflict. Our invasion of Iraq flooded Syria with refugees. 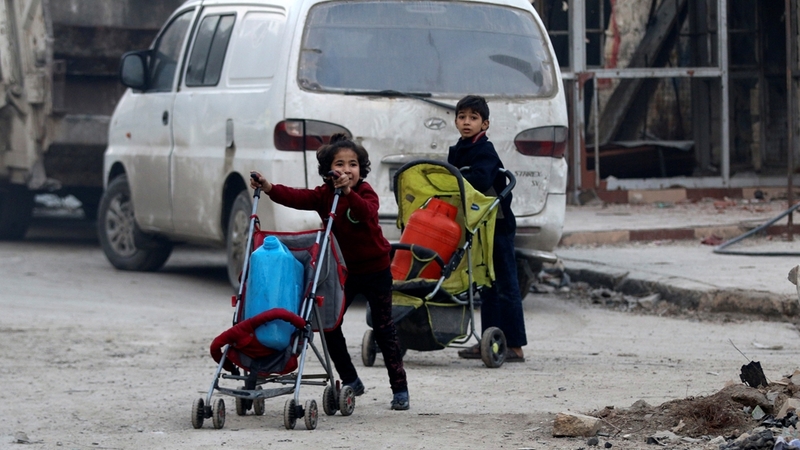 This, combined with a mass exodus of rural Syrians into the country’s urban centers as the result of a drought, placed a lot of stress on the country’s infrastructure and spread unrest. Photo by Nick Robins-Early/ Huffington Post. The conversation on Syria consists of many hypothetical ideas that, if enacted, would have had dire consequences. Tragically, the best course of action at this point is also an impossible one; Trump has attempted to ban any people of Syrian nationality from entering the United States. Although Federal Judge Robart’s injunction on Trump’s immigration order remains in place by the US appeals court, it does not look like many refugees will be accepted in this current political climate. We should always be sure to sift through the rhetorical garbage that all too often seems to pile up during important national conversations. All too soon it will be upon us to take the lead and aid in solving massive problems such as air strikes in Syria and other places in the Middle East and refugee entrance to the US. The subtexts for the proposals of congresspeople and other policymakers are all too often ignored. Photo courtesy of The New York Times, Al Jazeera, The Huffington Post, and The Wall Street Journal.